It’s still too early to know for certain what the new administration will do about building up the U.S. Navy, as the numbers are a moving target. But with President Trump’s recent pledge to add $54 billion to defense spending, it’s a safe bet to make that the fleet will grow. So let’s start with the numbers. There are different ways to count the fleet size, including whether or not you count auxiliaries, but let’s use this number as the baseline: There are 274 ships in the U.S. Navy now. The current objective is to increase the fleet size to 308, according to the approved 30-year shipbuilding plan and the FYDP, or Five Year Defense Plan. Every navy wishes it had more ships, people and stuff. Strategic priorities can change, technologies can alter the warfighting landscape and there will always be a competition for resources among the services. That said, the Navy’s most recent force structure review revealed a new number: 355. President Donald Trump’s January 27 executive order calling for a “great rebuilding of the Armed Forces,” a point reiterated in his February 28 speech to Congress. “I’m signing an executive action to begin a great rebuilding of the armed services of the United States, developing a plan for new planes, new ships new resources and new tools for our men and women in uniform,” Trump said at a Pentagon ceremony. During the campaign Trump called for a 350-ship Navy, which tracks with the Navy’s own force structure review that concluded that 355 ships were needed to meet combatant commander demands. The Navy conducted its own force structure assessment and commissioned two other studies to examine what kind of force the Navy needs going forward. Another study by MITRE said the Navy needs 414 ships, including three more nuclear aircraft carriers, nearly double the number of cruisers and destroyers requested in the Navy’s 355-ship plan (from 84 to 160), and an increase of 20 more attack submarines. MITRE’s analysis would cancel the littoral combat ship (LCS), but would create some new classes of ships, such as conventionally powered light carriers and diesel submarines, for example. The Center for Strategic and Budgetary Assessment (CSBA) concluded that 340 ships are required, plus an emphasis on unmanned vessels—such as smaller combat craft and sub hunting drones--to augment ships and manned aircraft to conduct a variety of operations. The CSBA study points to small combatants, like the Swedish Visby missile corvette, as a way to achieve numbers while maintaining lethality. Sen. John McCain’s recent white paper also proposes small patrol ships. And while there have been criticisms of the fighting capability of LCS, the Visby is an example of significant combat power on a small platform. The 640-ton Visby has a BAE Bofors 57 mm gun, the same as LCS and the Coast Guard’s National Security Cutter and Offshore Patrol Cutter, which can use very capable 3P ammunition; RBS15 anti-ship missile; antisubmarine torpedoes and can lay mines. There’s space and weight margin for 32 surface-to-air missiles. It has a hull mounted sonar, variable depth sonar and towed array; Saab 9LV combat management system; Saab Sea Giraffe AMB 3D surveillance radar, and Saab Ceros 200 stealth fire control radar system. And the combat system aboard Visby would easily fit on an LCS-sized ship. It takes many years to bring a new class of warships from the drawing board to the sea buoys. There are existing proven designs at sea today with the attributes the U.S. would need. One example, the Danish Iver Huitfeldt class of frigate visited Baltimore during a recent Flexible Ships Forum co-sponsored by the American Society of Naval Engineers (ASNE) and the Society of marine Architects and Marine Engineers (SNAME). In all of these ship counts, the total depends of what you count as a ship. This varies, so the numerical comparisons are not always apples to apples. When counting ships, some ships operated for the Navy by the Military Sealift Command are not combatants, but can have a direct role in supporting combat operations, such as replenishment ships, the expeditionary transfer dock (ESD) and expeditionary mobile base (ESB). MSC’s expeditionary fast transports are essentially high-speed commercial roll on-roll off ferries, and can be adapted for a number of theater security cooperation missions. While O’Rourke said expanding the fleet will create jobs, he also said the Navy officials have also identified readiness as a priority, and that maintaining and sustaining the fleet is also important to maintaining force structure. According to Paul Pedisich, author of a new book from the Naval Institute Press: Congress Buys a Navy: Politics, Economics, and the Rise of American Naval Power, 1881-1921, the president and the secretary of the Navy both need Congress to fund the fleet. “Obama had no money. Trump has no money,” said Pedisich. Wittman said the Navy’s plan is spot-on. Simple and straightforward, maybe, but it comes with a price tag. “In order to do that, and in order to meet the funding we are going to have to have for a stronger, bigger Navy, we are going to have to reverse this whole concept of sequestration,” Byrne said. At the height of the Regan build up, there were 594 ships in the Navy inventory, but with the end of the Cold War, the U.S. fleet began to decline in size, exchanged for the ephemeral “peace dividend.” This included the number of ships, number of different classes of ships, personnel and the engineering workforce behind them all. The Navy and industry both need to address the aging workforce with a human recapitalization program at the same time it needs to significantly grow the number of engineers and technical experts to design, build and manage the fleet. “In 1990 we had in 1,092 people in the engineering directorate, NAVSEA 05. 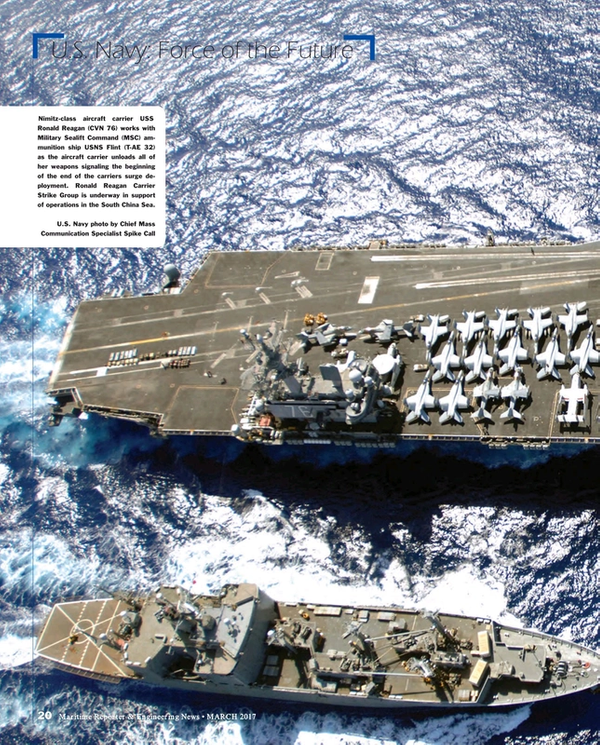 In all of NAVSEA, including the PEOs, we had about 4,500 people to manage these ships. And we had about 2,000 people in our Supervisors of Shipbuilding. “By 2005 we had less than 290 ships. We cut the fleet in half in a 15 year period, which coincided with a rather precipitous drop in our headquarters personnel at NAVSEA and in particular NAVSEA 05, which went down to 251. Today we are at 568 and we continue to ramp back up,” said Moore. “We continue to focus on growing. We anticipate being about 750 by 2025 based on the current 30 ship shipbuilding plan. If we get bigger, if we want to get to 355 ship, we’re clearly going to need more,” Moore said. The thought of increasing fleet size would be welcomed by the combatant commanders as the demand signal exceeds the availability of ships. And industry would obviously like more work. However, according to Rear. Adm. Michael Jabely, a surge in production isn’t a simple proposition, as his comments at the recent Surface Navy Association Symposium would indicate.